Find the perfect solid color flags when you shop with AttentionFlag.com. 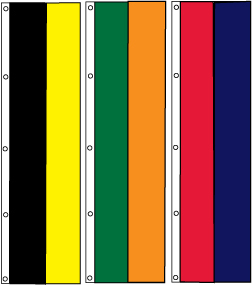 Our business provides 2-striped tall banner flags that can be made using any two colors you like! Each of these affordable flags is made using US made 200 denier UV-coated nylon. We always perform sewing to the highest standards available in the market. Each flag features double needle lock stitching, reinforced fly ends, a canvas heading, and brass grommets. Choose two colors that match your business colors to attract new customers today!